Prayer dominates the life of a seminarian. Prayers are the punctuation marks of his day; one could say that, in a way, his day is a prayer. A little consideration of the nature of prayer and of the seminarian manifests the point. To deal first of all with prayer itself, the classic definition is, “the lifting up of mind and heart to God,” with mind referring to the thinking, heart to the willing — not the feeling — part of man. Man needs to pray; it is the oxygen of his soul, opening it to God and filling it with life-giving grace. But if every man needs to pray, the seminarian needs to pray even more. He comes to the Seminary to consecrate himself to God’s service, becoming a cleric or servant of the Church. The cleric’s first job is to pray; every order he receives in the course of his training is directed in some way toward prayer. He offers to his Creator and Father praise for His majesty and thanksgiving for His many favors, while requesting all the goods and graces necessary for himself and his flock and offering reparation for his (and their) failings. Without prayer, he cannot hope to achieve anything solid and lasting in his ministry. If, by neglecting prayer, he makes himself the prime mover in the apostolate instead of God, he can be sure that God will leave him to discover his error by the withered fruits he produces. In the life of the seminarian, prayer is everywhere. After morning prayers and meditation comes the daily Mass, followed by breakfast (with a prayer before and after), then classes (with prayers before and after), lunch (with more prayers), recreation (very often with a prayer as well), rosary, dinner (once again with prayers), and finally Compline, the night prayer of the Church. In addition to all these times of prayer in community, he invariably offers up some private devotions, be it an extra rosary, Stations of the Cross, or a spiritual communion, while not forgetting daily reading from the Scriptures and from a good spiritual book (and these readings, rightly performed, are themselves prayers). All the foregoing public and private prayers, however, are time-limited; whether short or long, they will come to an end, and the seminarian will return to his daily tasks, studies, and chores. But prayer need not end there. It is possible and indeed desirable to pray always. This is done by offering every action to God throughout the day, no matter how trivial it may be. The little prayers before and after each activity are for just this purpose: to renew the supernatural intention, which tends to get swallowed up by the multitudinous cares of the day. By diligently cultivating these repeated offerings, the seminarian’s day becomes a continual prayer and at every moment he gives glory to God, earns graces for souls, and merits eternal life. Dom Jean-Baptiste Chautard, O.C.S.O. 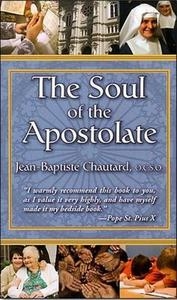 (1899–1935), a master of the spiritual life, wrote the "The Soul of the Apostolate" on the interdependency of the active and contemplative lives. It demonstrates the necessity of the Interior Life to a successful and spiritually fruitful apostolate. St Pius X called it "my bedside book." It is a must read for any Catholic.